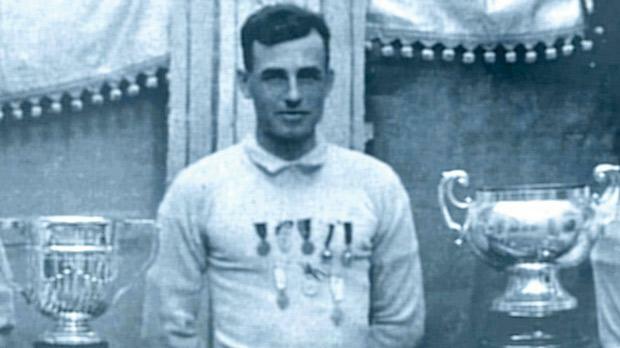 Goalkeeper Guzi Balzan posing with his medals and trophies. It is very difficult to assess the ability of players from the pre-World War One era. Matches in those days were huge events but competitive fixtures were few and far between. The league usually started late in the season, sometimes as late as December. The teams in the top division were few, usually not more than six, and the league was played on a one-round basis. Competition was still keen, however, and every game had the aura of a cup final. Attendances at the old Mile End stadium were enormous compared to our times. This increased the interest ten-fold. Footballers in those days enjoyed a popularity which nowadays is reserved to pop stars. There were many ‘star’ footballers and a few, like the great Floriana full-back Ruġġieru Friggieri and centre-half Gejtu Psaila, of Ħamrun, were treated like gods. One of the most noted foot-ballers of that particular era was Ġużi Balzan. He was not only a fine goalkeeper but also a very popular one. Between 1912, when he made his competitive debut with Senglea Shamrocks, and 1928 he played with no fewer than six different teams. His career was long and successful, winning the Cousis Shield in 1920-21 with Valletta United and in 1926-27 with St George’s. His career would have been even more successful if he chose to play for the more fashionable clubs of Floriana and Sliema Wanderers. But although he was much sought after by the two giants of Maltese football he always remained loyal to his native Cottonera. The Shamrocks were active between 1910 and 1913 when Balzan was their regular goal-keeper. Then, in 1913, when the Shamrocks were disbanded, he joined Cottonera United with whom he stayed for one season. Between 1914 and 1916, Balzan guarded the posts of Vittoriosa Rovers. Teams did not last long in those days and in the majority of cases, a club was formed only to be disbanded after two or three years. Between 1916 and 1919, there was a break in Balzan’s career. It is possible, although this could not be verified, that he joined one of the services and therefore was not free to play for civilian clubs during the duration of the war. At the end of hostilites, however, we find Balzan playing for Valletta United. This was one of the best periods of his career and in 1920-21 he formed part of the fine City team which beat Marsa United 2-0 in the Cousis Shield final. In 1921, his wanderings took him to Cospicua where he joined St George’s. This was a good move for Balzan and he stayed with the Saints up to 1928 when he finally retired. During this period, however, he played for a short while for Valletta Rovers when St George’s were disbanded by the MFA. In 1926-27, Balzan was the mainstay of the Saints’ defence when the Cospicuans beat Valletta 1-0 in the Cousis Shield final. St George’s were worthy winners. Throughout the 90 minutes and the extra half-hour, the Saints battered at the City goalmouth which seemed to have a charmed life. Valletta based their game on the counter-attack but on their few dangerous raids there was always Balzan solid as a rock to foil their efforts. Balzan was picked to play for the MFA XI only once. This was a meagre reward for such a good goalkeeper. He kept goal for the National XI on May 29, 1921 in a Charity Match against the Pick Navy which the Maltese team lost 1-3. He also played for St George’s in two prestigous matches against visiting foreign teams which drew great crowds. In 1927, Balzan kept goal for the Saints in the 3-3 draw against Gradanski, of Yugoslavia, and in 1928 in the 0-5 defeat against the famous Hajduks.